Faribault is home to a sizable Hispanic population. This file photo was taken at a downtown Faribault Mexican bakery, which has since come under new ownership. The bakery was once at the center of a controversy over its exterior color and was repainted when some local businessmen donated money for a new paint job. EVERY TIME I HEAR a derogatory comment about an ethnic group, I am still surprised. I don’t know why. Perhaps the fact that this is 2011, and not 1960, factors into my belief that people have overcome their prejudices toward those with skin colors different than their own. Then I hear a statement like this: “Willow Street is becoming a little fill in a Spanish word here.” I hadn’t heard the word before, which is why I can’t remember it. But I know for certain that it was unkind and derogatory and cutting toward the Hispanic population that lives in my community of Faribault, specifically along my street. I couldn’t allow the slam to go unchallenged, especially since it was spoken just as I was about to enter, of all places, my church for Sunday morning worship. With those words tumbling off my tongue, I walked into the sanctuary, attempting to dismiss my anger and focus on an attitude of forgiveness. I also consciously shifted my thoughts to an exchange I witnessed a day earlier. As a Somali mother walked into a Faribault grocery store with her adorable preschool-aged daughter, a Caucasian couple engaged the woman in conversation. They inquired about the little girl and asked her name. “Amira,” the Somali mother answered and smiled. I was trailing behind, thinking how my Aunt Dorothy has always called me her “Little Princess,” even now, today, when I am in my 50s. That endearing nickname has always made me feel so loved. Words can make such an impact. The mother of the little princess turned and rewarded me with a smile, a universal human expression that bonds all humans no matter their skin color. 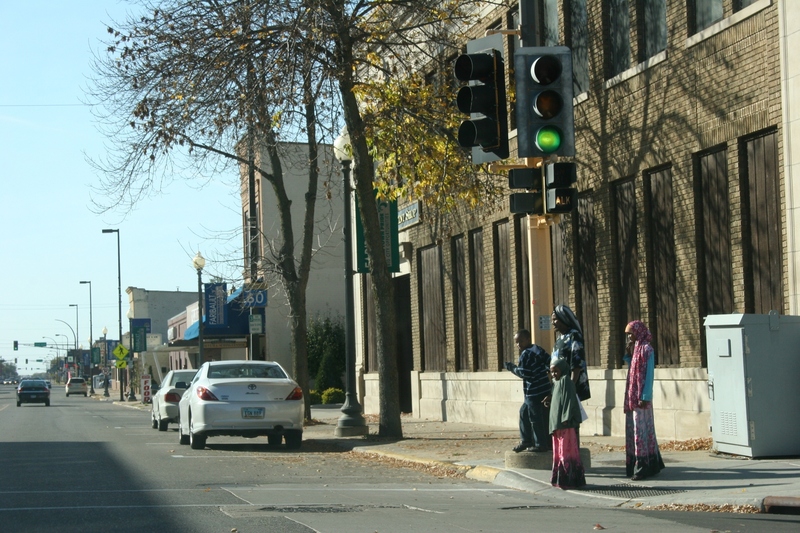 In this file photo, a Somali family waits to cross a downtown Faribault street. CLICK HERE TO READ one of many posts I wrote related to the exterior colors of two ethnic restaurants in downtown Faribault. 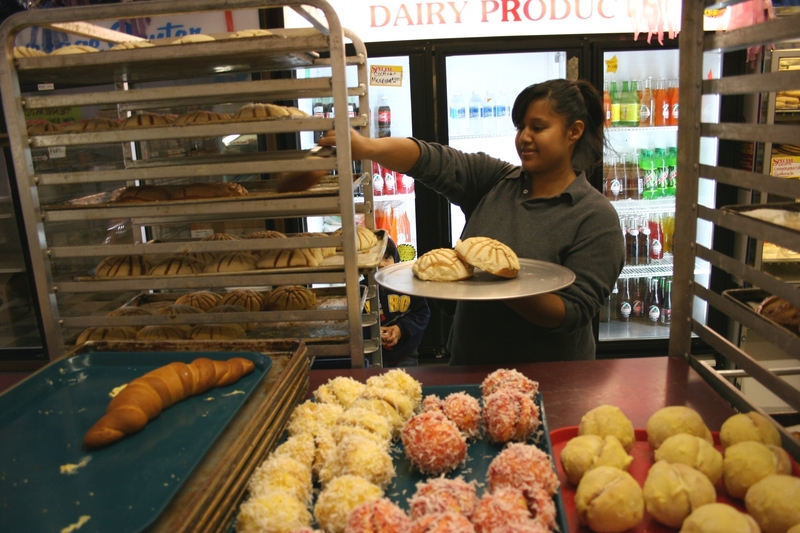 The color of the Mexican bakery, which has since changed hands, generated heated discussion within the community in 2009 and 2010.